The December-January issue was dedicated to Wonder Stories, and featured an autobiography of its Managing Editor, Charles Hornig. Hornig got his professional post at least in part due to his work on his own fan magazine, The Fantasy Fan. Yet another example of the ability of these early fan publications to launch the careers of both editors and authors. The storyline of Cosmos ended with a huge “bang” — a cataclysmic explosion that wipes out the planets Pluto, Neptune and Uranus. But in the pages of Fantasy Magazine, the passing of Cosmos was hardly noted. 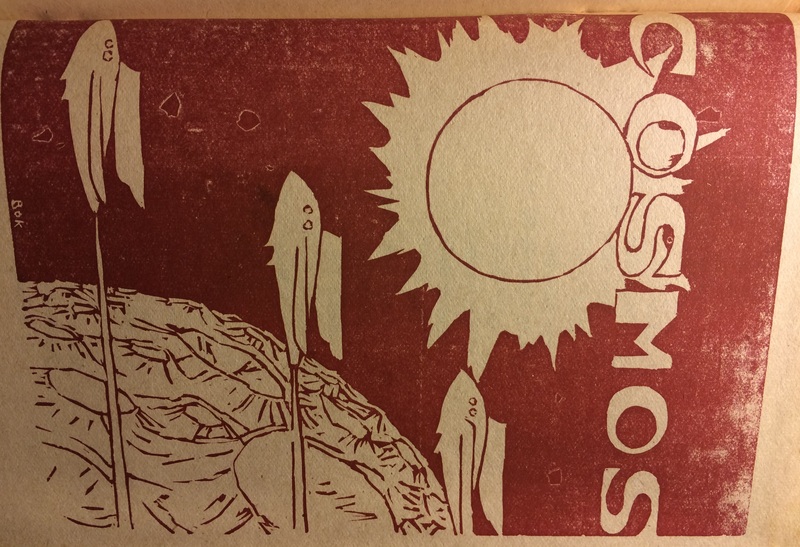 The Cosmos insert featured two additions, including an illustration by Hannes Bok (above) — possibly the earliest published work by an artist who would go on to a long and successful career as an illustrator of science fiction. A complete and updated list of authors and chapters was also added. Ray Palmer announced voting for the fans’ favorite Cosmos chapters in his column. 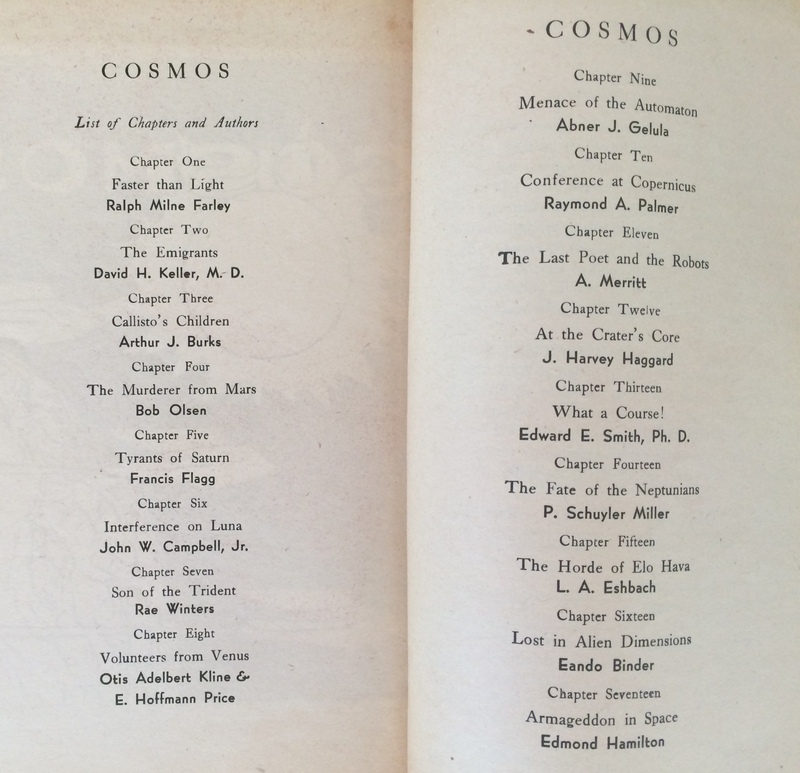 It’s the only mention of Cosmos in the entire issue, which included only 18 pages of content. The magazine was struggling, and it seems likely that the overhead associated with Cosmos was draining the resources and attention of the editors from things they found more interesting at the time. 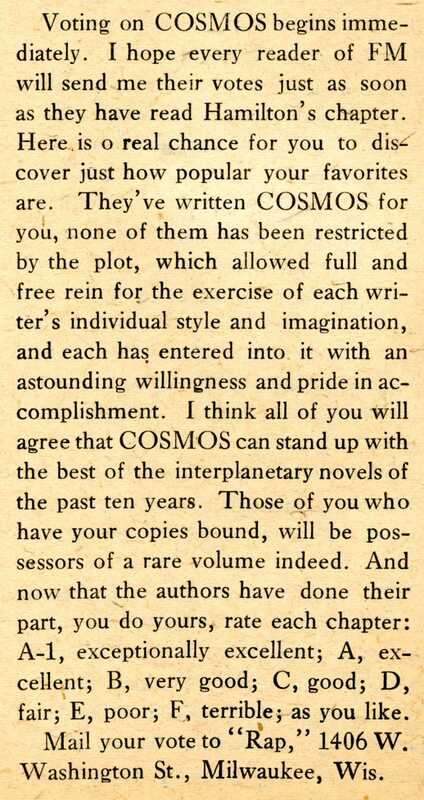 Ray Palmer’s assertion that Cosmos would “stand up with the best of the interplanetary novels of the past ten years” was neither challenged nor confirmed as Cosmos passed quietly into obscurity. Read Chapter Seventeen of Cosmos. Read about Cosmos references in subsequent issues.